Clean Living Collection is a skincare brand I have had my eye on for a while now due to reading countless rave reviews from green beauty bloggers and customers. 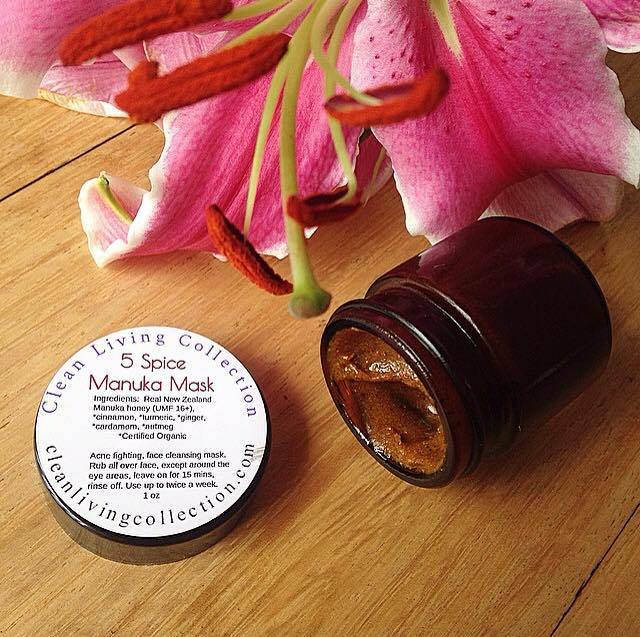 Clean Living Collection products are handcrafted, non-toxic and created with love and care. CLC uses 100% Certified Organic/ non-GMO ingredients: no fillers, coloring, or synthetic perfumes. I was so excited to be contacted by Ariel from the Clean Living Collection to try out a few products from her range. 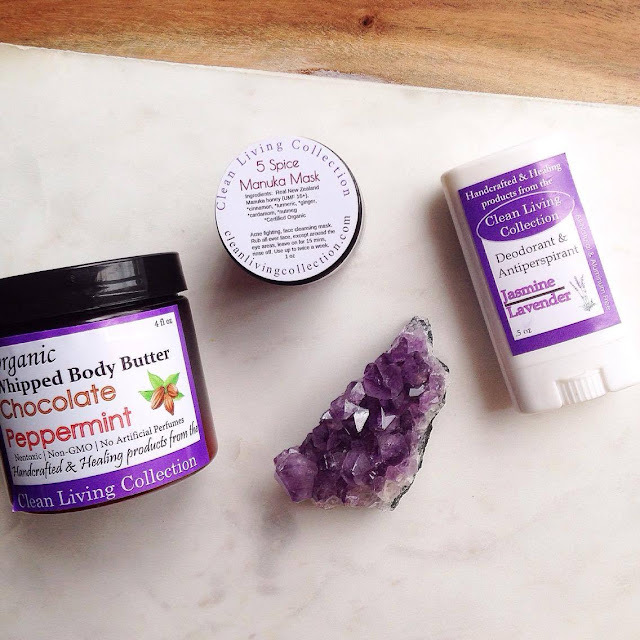 I have been trialling the 5 Spice Manuka Mask, Body Butter and Deodorant for several weeks now and thought I would share my thoughts with you below. I love honey as a skincare ingredient. 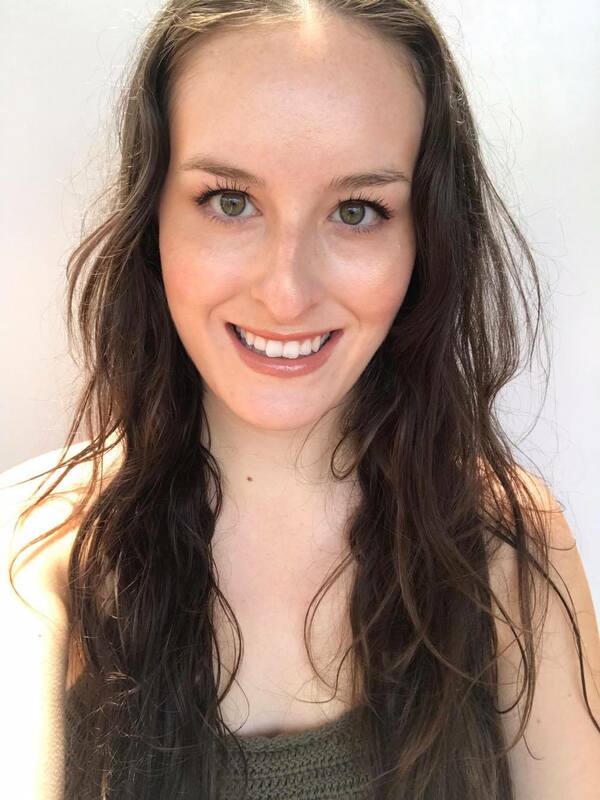 In fact, I used to apply manuka honey masks nightly to tackle my acne years ago when I began my natural skincare journey, and only stopped out of laziness. 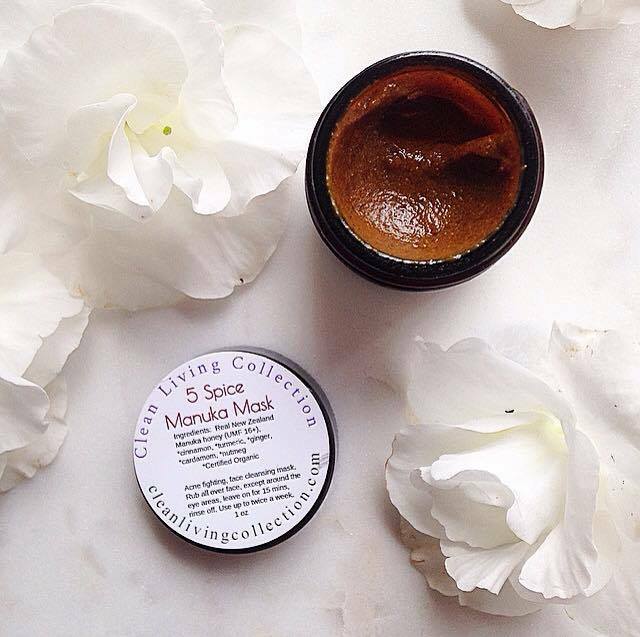 This mask takes it to the next level by including spices like cinnamon, turmeric and nutmeg in a base of UMF 16+ New Zealand Manuka Honey. Manuka Honey has potent anti-inflammatory properties, draws moisture to the skin, and is high in the antibacterial agent methyglyoxal to treat blemishes. Cinnamon improves fine lines by plumping the skin (it stimulates blood vessels and brings blood flow to the face), is extremely good at cleaning the skin and fighting acne (antiseptic and antibacterial), and reduces the signs of aging (it promotes collagen biosynthesis!). Turmeric is an excellent exfoliating agent (promotes skin cell turnover), fights acne by reducing oil secretion by sebaceous glands, and decreases inflammation and acne scars. Ginger is acne fighting (antiseptic and antibacterial), anti-aging (contains 40 antioxidant compounds), promotes blood circulation, reduces hypopigmented scars, and softens and tones skin. Cardamom is anti-aging, decreases wrinkles and age spots (powerful antioxidant), cleanses the skin and reduces acne, is a natural skin toner, and is rich in vitamin C and manganese (increases collagen production). Nutmeg is antibacterial (fights acne, analgesic (soothes skin by blocking nerve signals for pain), and has antioxidant properties. Full Ingredients: Real New Zealand Manuka Honey (UMF 16+), cinnamon, turmeric, ginger, cardamom, nutmeg. I love slathering this mask all over my face. It is very thick and I find applying it to a damp face much easier than trying to rub it all over my dry face. What I love about honey based masks is that they don't dry on your face, so you can leave them on as long as you want. I leave this mask on for 20 minutes minimum, and then rinse it easily away with warm water. This mask has a delicious sweet, spicy scent and it's hard to resist licking any product that ends up on my lips! My face is slightly flushed after removing this mask, which is due to the spices increasing circulation to my face and promoting healing. This mask is great at tackling both my acne and dry skin at the same time. It can also be used as a spot treatment. Apply a blob to any spots and leave for around half an hour, then wash off. This whipped body butter contains cocoa butter, shea butter and mango butter to provide a strong moisturising affect to the skin. 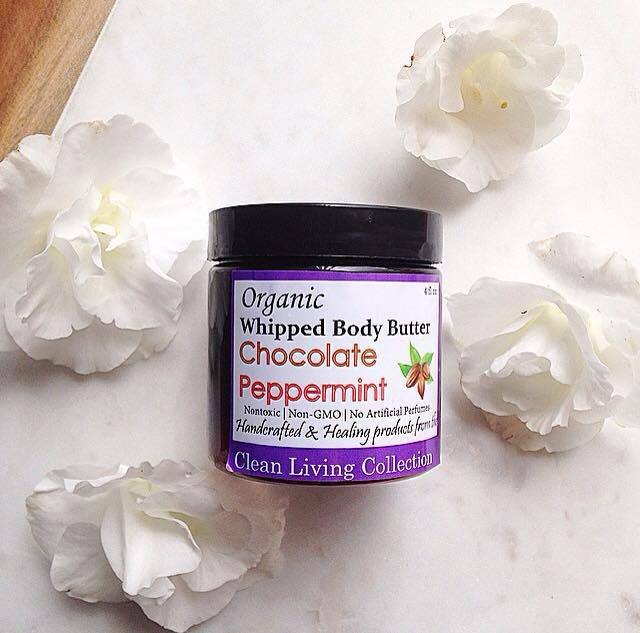 This body butter contains peppermint essential oil to soothe and relax muscles, and has a cooling effect on the skin. It comes in a 4oz or 8oz plastic container that is perfect for scooping out exactly how much product you need. Full Ingredients: *Cocoa butter, *shea butter, *mango butter, *coconut oil, *aloe vera gel, *sweet almond oil (infused with *vanilla bean), *arrowroot powder, *peppermint essential oil, non-GMO vitamin E oil *Certified Organic. This body smells so delicious! It smells exactly like Peppermint Crisp chocolate, and I have to remind myself it's not food every time I apply it. A little bit of this fluffy body butter goes a long way. This whipped body butter melts into a silky oil when applied to warm skin, and absorbs without any greasiness. It is beautifully hydrating for my dry skin, and the peppermint oil is refreshing and slightly cooling which is lovely. This body butter is also available in chocolate, citrus blossom, lavender rose, mint green tea, and vanilla almond. 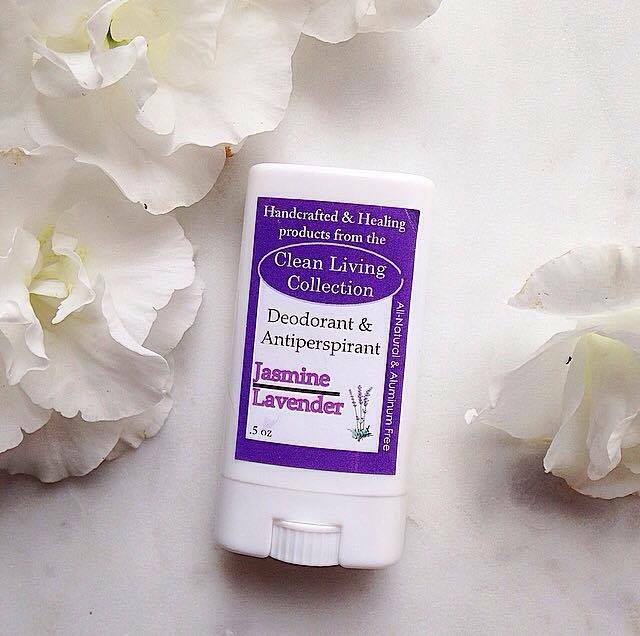 This deodorant is made with 100% certified organic and all natural ingredients. It contains coconut oil, shea butter and mango butter make this deodorant moisturising, while baking soda deodorises and kills stink. This is also a natural antiperspirant (it won't block your sweat glands like aluminium) due to arrowroot powder which absorbs moisture to keep underarms dry, and beeswax to make it waterproof. This deodorant comes in a tube which makes it more convenient than deodorant pastes that have to be scooped out of a jar. Full Ingredients: Beeswax (from Beekind in Sebastopol, CA), *coconut oil, *shea butter, *mango butter, *sunflower oil, *arrowroot powder, baking soda, *essential oils (whichever scent you choose), non-GMO vitamin E oil (derived from sunflower oil) *Certified Organic. This deodorant smells so lovely. I am not always a fan of lavender, but this scent is not overpowering in the least and it combines with one of my favourite scents; jasmine, to create such an alluring scent. I am lucky in that I now have a small collection of natural deodorants that work for me, and I am glad to say that this deodorant has now joined my tried and true favourites. This is one of the most effective natural deodorants out there! It has a firm texture, and is quite stiff when applying to my armpits, however it is currently winter where I am so I can expect it to soften slightly when it begins to warm up (if that ever happens!). I am a huge sweater and notice that I still sweat with this deodorant, however less than other deodorants I have tried. I am absolutely in love with all I have tried from Clean Living Collection so far, and recommend it to you for the effectiveness of the products and affordable price. For more information or to purchase your own products, visit Clean Living Collection's website.